The 1973 Endangered Species Act has rescued numerous individual species from extinction in the United States — think Rocky Mountain wolves or Florida crocodiles, for instance. But as the climate changes and humans continue to modify the landscape in a frenzy of plows, pastures and pavement, single species are not the only things in need of protection from extinction. Entire ecosystems — biological communities created through millions of years of evolutionary interactions between organisms — are at risk as well. Saving single species alone will not restore the intricate tapestry of relationships that shape ecosystems. To protect the habitat that supports those species and preserve services we humans rely on, from cleansing water for our cities and homes to buffering impacts of climate change, we need to save not just species, but also ecosystems, from extinction. The concept of ecosystem extinction has been recognized for some time in the scientific literature, but is just now beginning to gain widespread application in land management. In fact, the International Union for Conservation of Nature — source of the Red List of Threatened Species, our planet’s premier “high alert” when species start going down the tubes — is developing a red list of endangered ecosystems, similar to its threatened species list. To give tallgrass prairie and other endangered grasslands a fighting chance, conservationists are undertaking a series of unprecedented large-scale experiments aimed at restoring entire ecosystems near, and even beyond, the brink of extinction. The largest tallgrass prairie restoration in the United States sits amid a sea of corn in northwestern Minnesota. Glacial Ridge National Wildlife Refuge covers 22,800 acres (9,230 hectares), with plans in place to grow. Before the restoration — initiated when The Nature Conservancy purchased the land in 2000 — farmers had drained wetlands that intermingled with native prairie to improve growing conditions for crops. According to manager Gregg Knutsen, one key to the project’s success has been restoring the underlying hydrology of this vast prairie, rather than focusing solely on replanting native grasses. “When you put in subsurface drainage tiles, you’re disrupting the very complicated hydrology of a watershed,” Knutsen says. TNC removed the drainage tiles to re-create a patchwork of wetlands within the prairie, allowing diverse habitat to develop. This cannot be done effectively on small parcels of land, says Knutsen, which is why he sees Glacial Ridge’s massive size as its greatest asset. The refuge now hosts species whose habitat elsewhere has vanished. Male greater prairie chickens, bright orange air sacs bulging from their throats, dance through the uplands in spring to attract females. In summer, delicate white flowers of the western prairie fringed orchid grace the refuge’s moist lowlands. Knutsen believes that restoring the natural hydrology has allowed these diverse organisms to flourish in a way that smaller restorations focused on individual species could not. In addition to supporting a vibrant biological community, restoring the hydrology of the vast prairie landscape directly benefits humans. The complex flow routes through a natural prairie ecosystem slow the movement of rain and snowmelt, decreasing the potential for flooding downstream. Routing water through the dense prairie vegetation further allows plants to take up excess nutrients and pollutants before these chemicals reach waterways used for recreation and drinking water. While the size of the tallgrass prairie restoration at Glacial Ridge is unprecedented, the American Prairie Reserve in the Great Plains of Montana has an even loftier goal: creating an “American Serengeti” that will stretch more than 3 million acres (1 million hectares) across private and public lands in the western United States. This vision is possible because the arid shortgrass prairie of the western Great Plains has been less altered by agriculture than the tallgrass prairie to the east. American Prairie Reserve president Sean Gerrity says conservation biologists helped determine the size of the final proposed park. “Only at a minimum of 3.2 million acres [1.3 million hectares] will it provide room for wildlife to endure episodic localized natural phenomena like fire, disease and winter ice,” he says. A former tech entrepreneur from the world of Silicon Valley, Gerrity has applied his start-up mentality to creating the largest park in the Lower 48. He hopes to build a reserve similar to a national park in terms of visitor experience, except it would be privately owned. The sheer size makes the park too expensive for the government to purchase and manage, according to Hilary Parker, communications director for American Prairie Reserve. So the reserve is seeking some US$500 million in financial support from individuals and foundations to preserve the land forever and create an endowment that will support public use through trail maintenance and invasive species management. National parks suffer from “hard borders,” which reflect political, rather than ecological, boundaries. Even the largest tracts of land may be insufficient to protect the sometimes unpredictable travel of animals among breeding, foraging and wintering grounds. Animals that wander out of national parks such as Yellowstone as part of their natural migration are regularly shot. American Prairie Reserve protects the movement of animals across its borders by offering financial incentives to local ranchers who document wildlife on their pasturelands. 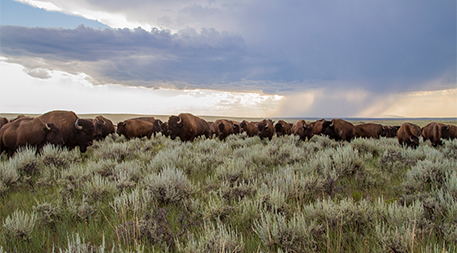 Such partnerships allow American Prairie Reserve to boost populations of bison, elk and pronghorn. These grazers maintain the grassland ecosystem by preventing tree seedlings from establishing in the prairie. American Prairie Reserve aims to increase herbivore numbers so much that they will lure grizzlies and wolves down from the mountains to recolonize their former prairie habitat. 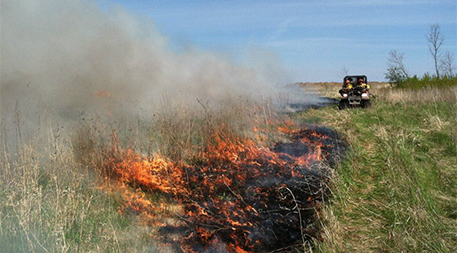 Restoring the natural fire regime and removing invasive species also strengthens other aspects of the ecosystem, such as the reciprocal relationship between native prairie wildflowers and their insect pollinators. Managers of massive lands near the top of the world are thinking even further outside the box. 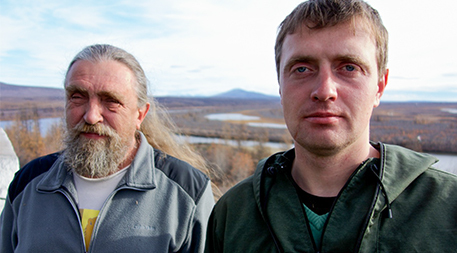 Pleistocene Park, a nature reserve in northern Siberia, is reviving a grassland ecosystem that went extinct thousands of years ago. The “mammoth steppe” was a wildlife haven during the frigid late Pleistocene, a geologic epoch ending 12,000 years ago. While much of the northern hemisphere was covered in mile-thick glaciers, this area of Siberia was a thriving grassland because the cold air was too dry to produce snowfall sufficient to build glaciers. Fossil evidence suggests that great numbers of wild horses, reindeer, musk oxen, bison and woolly mammoths grazed the mammoth steppe during the Pleistocene, playing a similar role to North America’s bison in maintaining the grassland ecosystem. Human hunting and climate change killed off most of these large herbivores 10,000 years ago, and slow-growing shrubs and trees have taken over the formerly productive grassland, creating a forest. Carnivores declined, too, as their prey disappeared. In a mammoth-sized experiment, Pleistocene Park director Nikita Zimov is reassembling an herbivore community to see if grazing can transform the system back into highly productive grassland. Herbivores, including Yakutian horses, musk oxen and moose, have already been reintroduced. These animals roam the 40,000-acre (16,000-hectare) park, which sits on land owned by an adjacent boreal forest and arctic tundra research station. In this one-of-a-kind experiment outcomes are tricky to predict, especially how animals will interact after being separated for thousands of years. Zimov says he believes the mammoth steppe will help combat global warming. Grassland is lighter in color than the forest it will replace, reflecting more solar radiation back into space. Further, the productive grassland will have a high water demand, reducing the amount of water in the soil. This drier landscape will produce less methane, a greenhouse gas with 25 times more warming potential than carbon dioxide that is produced when plants decompose underwater. Zimov expects the climate mitigation angle will be helpful in building a broad base of financial supporters for Pleistocene Park. Other whole-ecosystem restorations are taking shape in grasslands from Patagonia to Mongolia. But the risk is not limited to grasslands. As humans continue to modify Earth’s surface, we risk extinction of endangered savanna, forest, desert or other entire ecosystems, along with the rich evolutionary history imbedded in them. In contrast with single-species conservation, whole-ecosystem restoration not only protects more than individual species, it also brings in support from a diversity of stakeholders — whether their interest is in flood control, wildlife or climate change. While the first large-scale tests of whole-ecosystem restorations are occurring in grasslands, this approach could be applied to helping other ecosystems to thrive in perpetuity. By acting now, land managers can help other iconic landscapes avoid extinction also.